Phil Plait writes Slate’s Bad Astronomy blog and is an astronomer, public speaker, science evangelizer, and author of Death from the Skies! Follow him on Twitter. The time of first melting is getting earlier in the spring, and the time of refreezing getting later in the fall. This trend is bad, and not unexpected. As the world warms, the length of time sea ice can melt and stay liquid will increase. The obvious ramification of this is that in general more ice melts every year, since there’s more time to melt it. That much has been obvious for some time; pretty much any sort of graph you care to look at shows that over time the amount of ice we see at the North Pole is getting smaller. One thing to note: In the video, the narrator says, “Part of what’s causing the changes is increasing amounts of solar energy that’s being absorbed by the sea ice and surrounding waters.” I want to be clear, that does not mean there’s been an increase in the Sun’s output. It means that more sunlight is being absorbed by the ice and water. That’s because of two reasons. Ice is generally white and reflective, but as temperatures increase the Arctic ice is getting thinner, making it easier to absorb sunlight. Also, when it melts it exposes dark water underneath, which is also more efficient at absorbing sunlight. It’s a double whammy. 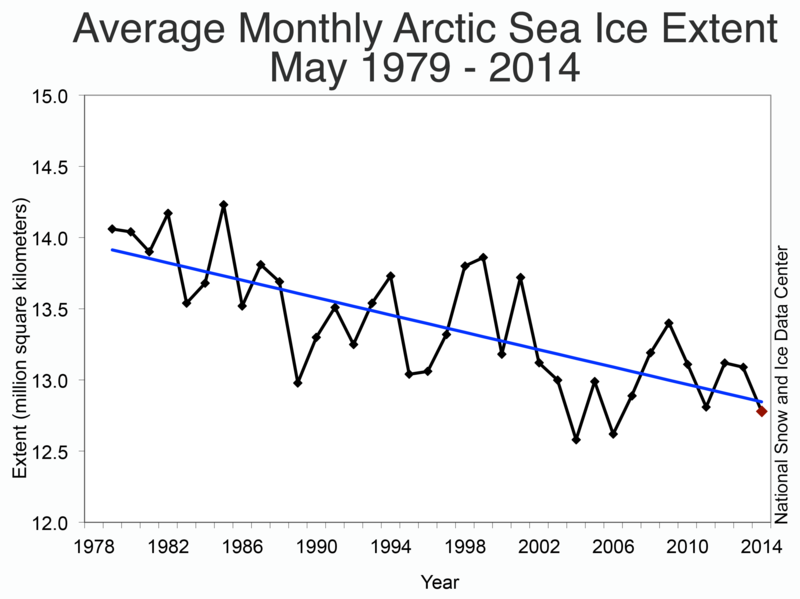 Arctic sea ice extent measured every May from 1979 to 2012. I believe the trend is obvious. The real question here is, what effect will this have on the rest of the planet? For one, there will be some increase in sea level from the melting ice, but how much is hard to say. For another, there have been some ideas that the changing sea ice can have a profound effect on weather at lower latitudes, including more common occurrences of things like the polar vortex that brought so much misery to the U.S. East Coast in 2013-14. Other studies indicate that extreme weather at southern locations won’t be affected much (though note that the authors of that study indicate that one reason extreme weather may be decreasing is itself due to global warming; cold comfort—haha—for those who deny global warming). However, one thing we’ve learned when it comes to climate: Small causes can have profound effects. Wiping out a few thousand cubic kilometers of ice at the North Pole will almost certainly have long-term effects we don’t yet know. The Earth is a big machine with a lot of moving parts, and if you kick one hard enough, it’s bound to have repercussions. Are we really willing to take that chance? When the stakes are so very, very high, perhaps we should have a care. What we’re doing here is a massive terraforming experiment on the planet we live on. That strikes me as a pretty dumb idea.